Combine marinade ingredients with skirt steak in a large freezer bag, seal and refrigerate for at least 2 hours or overnight. Remove meat from marinade, pat dry, and salt and pepper generously on both sides. For Grilled Green Onions, toss green onions in olive oil and grill over high heat for approximately 10 minutes, turning often until softened and slightly charred. Add salt and pepper to taste. For South of the Border Sauce, grill avocados, limes, jalapeño and onion over high heat until slightly charred on all sides, approximately 10 minutes. Remove. Peel avocados and place in a blender or food processor along with juice of the two limes, jalapeño, onion, garlic, canola oil and cilantro. Blend until smooth and add salt and pepper to taste. Clean and oil grill grate (Tip: Dip a paper towel in vegetable or canola oil and use tongs to wipe the grates with the oiled towel). Heat grill to high. (Tip: To test temperatures without a thermometer, hold your hand over the grate and see how long you can keep it there before it gets too hot. 2–4 equals high, 6–8 seconds equals medium and any longer is low.) Grill skirt steaks approximately 4 minutes per side for medium rare. Remove. Cover with foil and rest 10 minutes. Meanwhile, brush tortillas with olive oil and grill approximately 2 minutes per side until warmed and slightly charred. 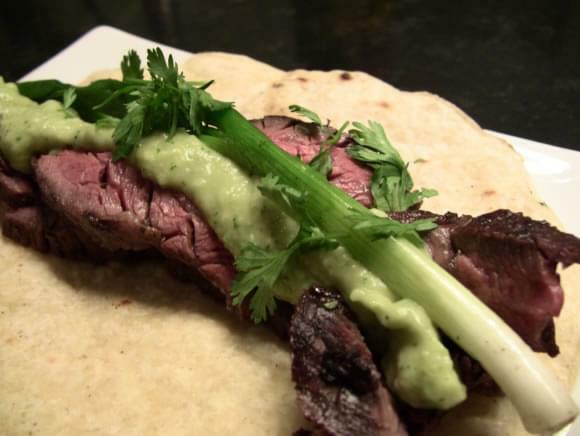 Slice skirt steak against the grain (Tip: Slicing fibrous cuts such as skirt steak against the grain creates smaller meat fibers thereby ensuring more tender strips of steak) and serve on tortillas along with South of the Border sauce, grilled green onion and cilantro.